Take a trip to Japan and other foreign lands with Sunday in Kyoto. Written by Gilles Vigneault, one of Canada’s premier music figures, and sung by Patrick Watson and others, these fun and cheerful tunes take you on a tour around the world. If You Bump Your Knee reminds us of a Japanese haiku, Sunday in Kyoto presents music from the orient, and in Yoshi and His Boat, the boat is paper and made using origami. Other tunes also have an international feel, but there are some that are just pure fun. Kids will giggle along with One, Two, Three, ABCD as old man McGee’s cow farts and pees. The Secret Mountain is dedicated to creating the highest quality children’s books and music. 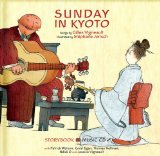 Sunday In Kyoto includes the audio CD, plus a beautifully illustrated book with the story of the title track, and lyrics for the rest of the songs so kids can sing along. Fun and international flair go hand-in-hand in this delightful set.